By buying this product you can collect up to 4995 bonuspoints. Personvagn 1:a klass Av4üm-62 'Rheingold 1962' typ DB, innerbelysning, längd över buffertar 75 cm, epok III. 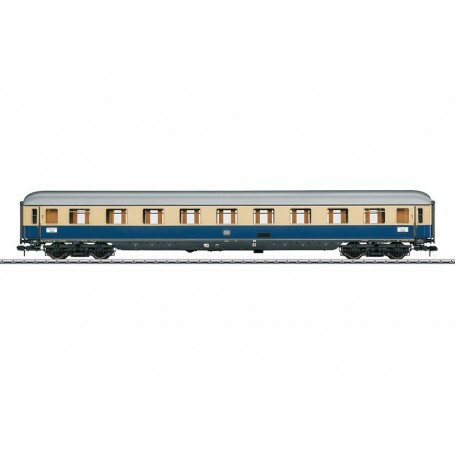 Model: This express train passenger car looks as it did around 1962. The roof shapes, side walls, underbodies, and skirting are specific to the type of car. The trucks are Minden-Deutz designs with brake shoes and magnet rail brakes and separately applied generators. The car roof can be removed from the car. The car has a detailed interior and built-in interior lighting. The car has guide mechanisms for the couplers in order to provide close-coupled car spacing. Reproduction prototype couplers can be installed on the cars. The minimum radius for operation is 1,020 mm / 40-3/16'. Length over the buffers 75 cm / 29-1/2'. Prototype: German Federal Railroad (DB) type Av4üm-62 compartment car. 1st class. Special design for long-distance service, version with rounded roof ends. Paint scheme for the 'Rheingold' of 1962. The cars from the 58058 set are now being offered individually in response to many customer requests. The class E 10.12 electric locomotive, item number 55010, goes ideally with this 'Rheingold' car. Other 'Rheingold' cars can be found under item numbers 58087, 58088, 58095, 58096, and 58097.